This is not the FDA Lasik site. The FDA Lasik site is here. Instead, this site was created to expose deceit, corruption, and collusion by the FDA and the LASIK industry. You've read the hype about the ten minute miracle. Now get the truth. Leave it to the FDA to deny that they ‘MESSED UP’. Mr. Waxler admitted 10 years after his retirement what most LASIK casualties have been trying to say since the late 1990s. The FDA continues to downplay the risks further allowing more people to get damaged from this procedure - when is enough enough? At least Mr. Waxler has taken his time to actually talk to damaged patients on a personal level (myself included), which is more than I can say for the FDA. I commend Mr. Waxler for his honesty. Could LASIK Lead to 'Permanent Vision Problems'? A former Food and Drug Administration official who helped get the vision correction surgery LASIK approved back in the 1990s but later spoke out against the procedure is taking his concerns directly to current regulators at the FDA. Morris Waxler, who is now an independent regulatory consultant, filed a citizens petition today urging the agency to take steps to stop what he calls "the epidemic of permanent vision problems" caused by LASIK. Waxler's petition implores the FDA to take actions to crack down on the procedure, including issuing a public health advisory that warns the public about the dangers associated with LASIK and implementing stricter controls over LASIK device manufacturers and practitioners who perform the surgery. In the petition, Waxler included data that he said were evidence that "LASIK causes persistent vision problems with an overall success rate of less than 50 percent; a failure rate of more than 50 percent." Waxler said his change of heart came about after he retired from the FDA in 2000. He started getting complaints from people who suffered serious side effects from the procedure, including seeing halos, impaired night vision and excessive glare. He was surprised when he looked back at the data presented when LASIK was undergoing the approval process in the late 1990s. "When I looked back at that data, there was a tremendous consistency that show these problems exist in about 18 percent of people who had LASIK, most of them after I left the FDA," he said. Some doctors, however, say while they agree with the estimate that thousands of people have had problems after having LASIK surgery, they stress that the vast majority of people are very happy after having the procedure done. "Ninety-nine percent of people who have had LASIK have excellent results," said Dr. Robert Cykiert, clinical associate professor of ophthalmology at NYU Langone Medical Center. "Millions of people have had the procedure done with a high success rate." One of those satisfied patients is Andy Ng of Long Island, N.Y.
Ng had LASIK in 2004. He decided to go through with the procedure because he got tired of spending hundreds of dollars on glasses that needed special lenses and would get banged up because of his participation in sports. He also found contact lenses cumbersome and time-consuming. He said he already knew about the side effects before he went in for the surgery. "I knew for a fact I was going to have halos at night," Ng said. He added that aftewards, the halos didn't make much of a difference for him. "I have no other problems, such as floaters, dry eyes, etc.," he said. Doctors stress that LASIK is no different from any other medical or surgical procedure. "We always would like to have any medical procedure or surgical procedure that works 100 percent of the time, but that doesn't exist," Cykiert said. "Complications do happen, but it's rare, and often, we're not sure why," said Dr. Penny Asbell, professor of ophthalmology at the Mount Sinai School of Medicine. Doctors also say that even if a patient is an ideal candidate, the surgeon is very skilled and the equipment is top-of-the-line, problems can still occur, so it's difficult to predict whether someone will suffer from LASIK-associated side effects. Not everyone is a candidate for LASIK, and doctors say it's important for prospective patients to understand that. People with vision that continues to get worse, extremely poor vision, certain characteristics of the cornea and some diseases may not be suitable candidates for the procedure. "Doctors need to take time with a patient and get all the information they need," Asbell said. "Doctors also need to learn what the patient's expectations are. If a person wants 20/15 vision, they may not be the best candidate." Experts also say there are still things about LASIK that they just don't know. "It's very hard to quantify these side effects, such as determining how to measure how bad things like glare and halos are," Asbell said. "It's hard to pin down risk factors that differentiate the people who have problems from the ones that don't so we can try to learn more." "There are many things we still don't know about the cornea, such as physiology and variability in structure, so we don't know why some patients bounce back and others don't," Cykiert said. Cykiert also said that the thousands of people who have problems have a legitimate reason to complain to the FDA, and that information they provide can be helpful for everybody. "That's how we're going to make the procedure safer and better," he said. And that's also how there may eventually be more people like Andy Ng, who has no complaints about his LASIK experience. "The procedure is one of the best things out there for the eyes," he said. AT LEAST SOMEONE FDA RELATED HAS A CONSCIOUS! April 25th, 2008 was a historic day for the Food and Drug Administration. On that day, a number of medical doctors, optometrists, psychologists, and injured patients presented at a Special Hearing of the Ophthalmic Devices Panel, responsible for the approval of medical devices for ophthalmic use in the United States. The subject of the hearing was post-LASIK quality of life, depression, and suicide. The mass media attended and filmed the April 25th hearing. Nevertheless, the substance of the above allegations went mostly unreported, despite the presentation of four completed post-LASIK suicides, including excerpts from two actual suicide notes (these presentations are included in the videos at right). The American Society of Cataract and Refractive Surgeons (ASCRS) asserted that individuals with psychological issues post-LASIK certainly had psychological issues all along. To anyone without a preconceived bias, the ASCRS position seemed indefensible. Still, the mass media focused on a 95% percent satisfaction rate, a statistic put forward by ASCRS, but not yet published in their own peer-reviewed literature. Why? Fortunately, the entire event was captured on video. Moreover, FDA transcripts are considered government documents, and as such, are not subject to copyright laws. Beyond the obviously sad assocation between severe LASIK complications, depression, suicide, and medical deception and corruption, the April 25th Special Hearing of the Ophthalmic Devices Panel must be regarded as one of the most interesting sociological dramas in modern medicine, one which is still being played out. This site chronicles the events leading up the meeting, including press releases by the American Society of Cataract and Refractive Surgeons (see here and here), videos by presenters on both sides, and the reaction of the American press. 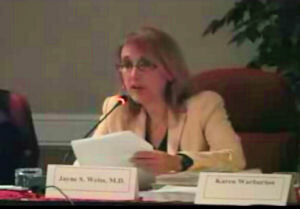 Dr. Jane Weiss chaired the Ophthalmic Devices Panel meeting in Gaithersburg, Maryland on April 28th, 2008. Press releases issued by ASCRS before the hearing stated that the "FDA confirms that LASIK is safe and effective." Yet, Weiss clearly opts for glasses. Perhaps it's good enough for the public, but it's not good enough for Dr. Jane Weiss. Reports of LASIK complications to the FDA's MedWatch program (MAUDE Database) for medical device adverse events have nearly doubled since the public announcement of the the April 25th, 2008 Special Hearing of the Ophthalmic Devices Panel, held to discuss post-LASIK quality of life, depression, and suicide. At the hearing, two medical doctors, two optometrists, three psychologists, and a number of injured patients presented compelling information establishing a causal link between bad LASIK, depression, and suicide. Excerpts from two suicide notes were presented, including that of a medical student (video: http://www.youtube.com/watch?v=UX855jmViaM) and that of a police officer who was well respected in his community (video: http://www.youtube.com/watch?v=PBAqnVfJ5GU). The recent, rapid growth of complaints in the MAUDE database is, presumably, particularly embarassing for the American Society of Cataract and Refractive Surgery (ASCRS). In its April 7th, 2008 press release, ASCRS attempted to spin public perception of the Special Hearing by stating that "Between 1998 and 2006, the FDA received a total of 140 comments relating to LASIK dissatisfaction, representing less than 1 in 10,000 U.S. LASIK patients." Unfortunately for ASCRS, nearly twice as many complaints have been received in the last six months as in the last ten years since LASIK's approval. The growth of complaints is also embarassing for the FDA, since some patients at the meeting charged that they are victims of an ongoing medical coverup, perpetrated by collusion between ASCRS and the FDA. Indeed, in its April 7th, 2008 press release, ASCRS stated that "The FDA reaffirms that LASIK is both safe and effective." LASIK critics have responded to this assertion by asking publicly "When exactly was ASCRS authorized to make public announcements for the Food and Drug Administration?" Three other sources of information suggest collusion between ASCRS and FDA. First, prior to the Special Hearing, patients who came to the FDA's website were encouraged to use a comment form to report their vision issues and dry eye complaints to the FDA. Unknown to patients, these complaints were held by FDA Center for Devices and Radiological Health (CDRH), but were never registered in the MAUDE reporting system. Neither were they reported in the April 7th ASCRS press release. Why did the FDA CDRH choose to suppress these complaints? Was it to make LASIK look safer than it really is? Even though LASIK surgeons are required to report adverse events from LASIK to the FDA, most surgeons have apparently never filed a single MedWatch report, despite the fact that ASCRS admits that up to 5% of patients are dissatisfied with their results. Second, compare the ASCRS press release with a 2006 document issued by the FDA CDRH at http://www.fda.gov/cdrh/postmarket/mdpi-report-1106.html. In this document, CDRH states frankly that "The data that are submitted via MDR rely upon a generation-old software platform (MAUDE) to organize, store and allow management of the data. This software, due to its age and limitations, does not allow MDR to serve its customers well. FDA staff and stakeholders report that MDR...does not provide timely and usable data to staff or other system users...[and]...has a large backlog of reports which hampers the ability to detect signals or identify problems." Obviously, this document establishes that the FDA has long been aware of deficiencies in the MAUDE reporting system. Why, then, did the FDA allow ASCRS to speak for the agency? Why was ASCRS allowed to publicize deficient and inaccurate information in order spin public perception about the safety of LASIK? If the MAUDE system was known to be broken, why were complaints issued to the agency through its LASIK comment form never counted? Third, according to an article in the June 2008 issue of Cataract & Refractive Surgery Today, in November 2006, the same month the FDA released criticism of its MAUDE reporting system, the FDA approached ASCRS and American Academy of Ophthalmology (AAO) to form a Joint LASIK Study Task Force in response to complaints sent to the FDA and Congress by damaged LASIK patients. Apparently, ASCRS surgeons had over 1.5 years notice of FDA's intention to call a Special Hearing for LASIK post-market issues. In contrast, medical doctors, optometrists, psychologists, and injured patients who spoke on behalf of thousands of LASIK victims were not aware of the planned hearing until it was publicly announced in the Federal Register at the end of March, 2008. These individuals had just one month to prepare. Why did the FDA give the LASIK industry 1.5 years notice of the Special Hearing while patient groups and the public had only a one month notice?